As a girl with two science degrees, there’s no point pretending I’m not a ‘geek’ at heart. My favourite line of experimentation of late has been the ‘fast roast’. I’ve noticed that most recipes have us cooking at a sedately 200C (400F) or lower. But the hotter the oven the faster dinner is ready, right? So I’ve been cranking my oven up and seeing what happens. 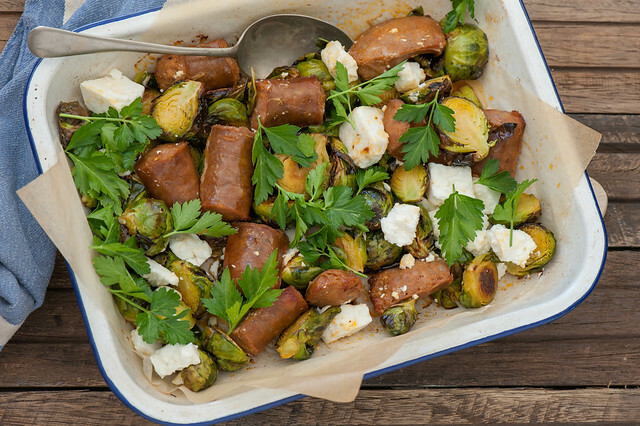 You’re not going to believe it, but when you’re cooking smaller pieces of food like these bite sized chunks of spicy sausage and Brussels Sprouts dinner cooks quicker without any ill effects. I know. So many possibilities! If I can’t convince you that Brussels Sprouts are super tasty when cooked like this, don’t worry, there are plenty of other tasty veg options in the ‘variations’ below. 1. Preheat your oven to 250C (480F). Halve brussels sprouts lengthwise and place in a roasting tray. Drizzle with oil and cook for 10 minutes. 2. Chop chorizo into bite sized chunks and add to the tray. Roast for another 10 minutes or until Brussels Sprouts are tender and chorizo is cooked through. 3. While the veg are cooking make the dressing. Combine vinegar with 2 tablespoons extra virgin olive oil. Season with salt. 4. When the chorizo and veg are cooked, crumble feta over the top and cook for another 1-2 minutes. 5. 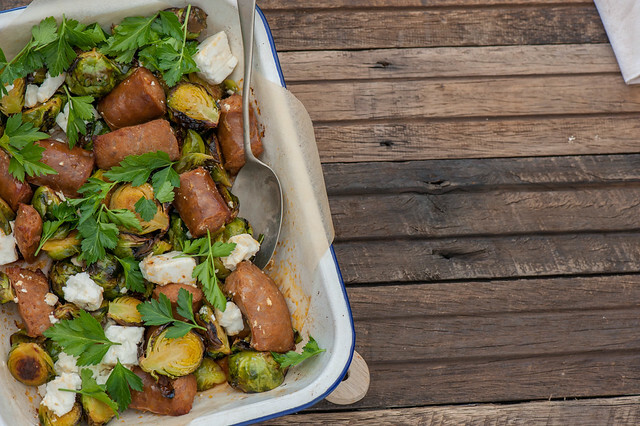 Drizzle dressing over the cooked chorizo, sprouts and hot feta. Scatter with parsley and serve warm. different veg / more veg – Broccoli or cauliflower are really lovely. Or for a more summery vibe use diced eggplant (aubergine), zucchini and capsicum (bell peppers). If you want to use green beans, snow peas or sugar snap peas they’ll cook in about the same time as the chorizo. Button mushrooms or sliced large mushrooms are so tasty cooked this way. extra umami flavour – Add 1 teaspoon soy sauce with the dressing. And use less salt to season. carb-lovers / more substantial – toss in cooked pasta or serve with warm pita or tortillas. Or add boiled potatoes to cook with the brussels sprouts. dairy-free – replace feta with roasted nuts like almonds, brazil nuts or hazelnuts. no chorizo – use any sausage (spicy or otherwise). Fish fillets or chicken thigh fillets will also work. The fish will take about 10 minutes (less if really thin) and chicken will take longer so add them at the beginning with the sprouts. If you like you can add a teaspoon or 2 of smoked paprika to the dressing to get that lovely smokiness. 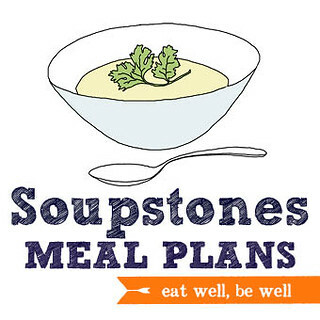 vegetarian – use drained canned chickpeas instead of the chorizo. I also like a few handfuls of roast hazelnuts or almonds added with the feta. Or serve the roast veg, parsley and feta with a poached egg. saucy – the hot feta makes a lovely flavour highlight but if you like it saucy serve with some home made mayo or my miso harissa ‘ketchup’. Glad you like it Aria! Jules, you’ve outdone yourself with this one! I love your magic sausage supper, but this recipe is over the top with ingredients I love. This morning I discovered that one of our local Mexican markets has link chorizo (I usually only find it in bulk). I bought some of the bulk today, and it is good, so the links would be even better. I might throw some potatoes into this, in honor of your Irishman – and since we like our dinners with carbs. this was really good Jules. My daughter thought it was a weird combination but she liked it. So simple but really good. I had to double it because my Husband and Son eat soooo much. Thank you for all your recipes. I have a print book of yours, the 5 ingredient one. I hope you do another one some day like that one!! I know this is an older recipe but I finally tried it and WOW. I have a gas stove so was a bit concerned about the temperature – it took forever to preheat but worked swimmingly. I substituted zucchini as suggested, used hot Italian sausages (all my store had), omitted the parsley (not a fan), and used balsamic vinegar for the dressing (definitely a fan). It sounds like a lot of modifications, I swear, but this was still fantastic and 10 minutes x 2 was spot on for the cook time. The hot feta really made it for me. Nice work on the variations Rachelle! I added some broccoli, and it soaked up the chorizo spice wonderfully. I’m always amazed at how buttery brussel sprouts taste when you roast them. I don’t understand why people dislike them!